We are a wholesale distributor of quality medical devices located in the USA. We offer a wide variety of products ranging from Mobility, Patient Care, Blood Pressure and Respiratory Care. We are a manufacturer/distributor of quality medical products located in the USA. RMS is in its fifth year of operation and proudly boasts an increase in market share by 50% plus each year. We market domestically to the entire USA including Hawaii with potential new growth internationally to the Canadian and Asian markets. 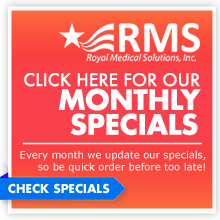 We have our own, Royal Medical Solutions, Inc. (RMS) branded product range manufactured and assembled by RMS domestically and/or internationally. We use an independent sales force to enhance our visibility in all markets including: DME, Pharmacy, Grocery Stores (both independent and chain), hospitals, independent living centers, surgical centers and none brand specific retail outlets. Our product selection and development is greatly supplement through our Global Sourcing which includes Canada, Taiwan, China and European commonwealth. Our mission is to provide quality service in order to build your trust and become your primary wholesale distributor of popular and hard-to-find medical supplies designed for both children and adults.